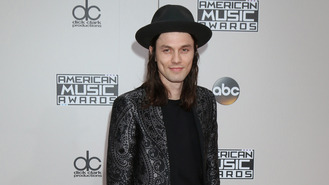 James Bay “lost his mind” twice when he found about his Grammy nominations. The British singer made the shortlist for Best New Artist, Best Rock Album and Best Rock Song for Hold Back the River at the 2016 ceremony. And while he wasn’t victorious in any of the categories, the memory of being nominated for the prestigious American music awards is one that will stay with him forever. “I was in a car on the way to Jools Holland’s Hootenanny last year (15), scrolling through Twitter,” he told Q magazine. “My manager said I suddenly went white, I wasn’t sure what I’d seen because you don’t always know what to believe on Twitter. We confirmed it from the official site through - I’d been nominated for a Grammy. James also got to perform at the 2016 ceremony, held in February. He sang with fellow best newcomer nominee Tori Kelly, with the pair wowing the crowd with their rendition of Hollow/Let It Go. Prior to getting on stage, the 26-year-old hat-loving singer admits he was a bag of nerves. “On the night, I was performing and kept saying to myself beforehand, ‘I’m nervous and it’s going to get worse.’” he recalled. Little Mix have already held talks for a follow-up to 'Glory Days'. Justin Bieber has confirmed he's a single man and isn't "really looking" for a relationship. Star Wars icon Carrie Fisher is still fond of her ex-husband Paul Simon's music - especially the mean songs she inspired. Dolly Parton is organising a telethon to aid the victims of the recent Tennessee wildfires, according to reports. Emeli Sandé is set to go on tour next year. Singer Meghan Trainor has fallen in love with her new boyfriend Daryl Sabara. Alicia Keys is excited by the support she’s received following her decision to ditch make-up. Miley Cyrus is teaming up with her godmother Dolly Parton to help those affected by the recent fires in Tennessee. Prince's estate executors have racked up $2.3 million (£1.8 million) in legal bills in a three-month period.